Hello everyone. Me is back again with a great holiday. Today, August 12, it is World Elephant Day. Me love elephants. They are huge, but are also sweet and cuddly. 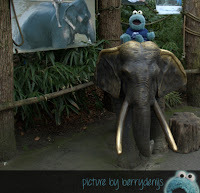 Me never sat upon a real elephant, but me like to sit on top of the real statues at the zoos in the Netherlands. It is amazing to look at elephants. These giants are so gentle and only are fighting if it is truly necessary. That is why it makes me so sad when me hears baby elephants get orphanaged because of hunters shooting the elders of the family. Me thinks this must stop so maybe, just maybe me can one day see one in the wild. 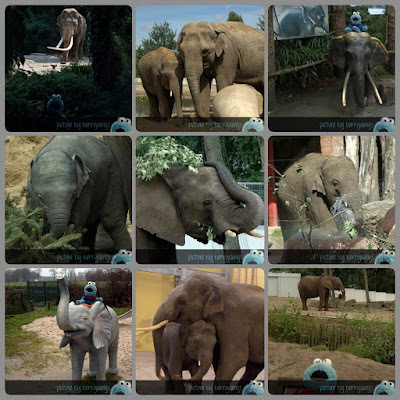 In the meantime, me will enjoy the elephants me can visit at the zoo! Me sure love elephants. Do you? Me made a collage of some Elephant love. Cute huh.